Germany began the Second World War with 50 mm and 81 mm mortars. The light 50 mm Granatwerfer 36 was standard equipment in every rifle platoon, but although it was a very good weapon it was used less and less and withdrawn entirely by 1943. The medium 81 mm Granatwerfer 34 was also standard issue, and had a range of 2,400 m, but with a weight of 56 kg it was considered too heavy for airborne troops, so a new model was developed, the Granatwerfer 42. This weighed only half that of the model 34, but had a barrel length of 75 cm compared to the 114 cm of the 34, which meant its range more than halved. Despite this the 42, nicknamed the Stummelwerfer by the troops, was widely used and in time replaced the 34. During their invasion of the Soviet Union the Germans captured large quantities of the Soviet HM38 120 mm mortar, and finding it an excellent weapon they quickly developed their own version, named the schwere Granatwerfer 42, which was first issued in late 1942. The smaller of the two mortars in this set is 81 mm calibre, and with a barrel length of 15 mm this makes it the older Granatwerfer 34 as used at the start of the war. The weapon comes in three parts (barrel, bipod and baseplate) and is both very well detailed and simple to construct. The large mortar is of course the powerful 120 mm Stummelwerfer, with its long barrel and two-spring shock absorber unit. Once again this is a well detailed weapon and very accurately done. The mortar crew come in a lot of different poses as can be seen, although it could be argued that all the figures are unique since one of each 'pair' as labelled above has been provided with entrenching tool or bayonet, gas mask, water bottle, breadbag and mess tin while the other is without kit. The poses are very good, with men feeding the mortar, adjusting the elevation, bringing up more bombs or simply protecting their ears. As you might guess, these poses are only achievable by having multi-part figures, which in most cases means either one or both arms are separate. These mostly fit very well, and the whole set is in quite a firm plastic which readily takes normal polystyrene cement to form a strong bond. However it is not always immediately apparent which arms match with which body. Entrenching tools are also separate, as normal for Pegasus Germans, as are the bases, of which several designs are provided, each with just one hole so any figure can fit any base via a single peg under one foot. The uniform of the men is correctly done and is more suggestive of the earlier part of the war than the later part, but none of them have ammunition pouches on their belts, which we found surprising. The standard of sculpting is excellent and there is no flash to worry about. 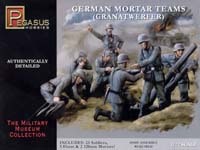 In a direct comparison with the equivalent set from Armourfast, the mortar itself is much better detailed in the Pegasus set and the Armourfast figures are more appropriate to the late war, which makes them a better match for the late war 120 mm weapon. However both sets are very good and between them cover the subject extremely well.